Attorney General Eric H. Holder Jr. called for “wholesale change” in the Ferguson Police Department, the Associated Press reports. Holder sad in a question-and-answer session with a newspaper at the Washington Ideas Forum that serious changes are needed. But Holder didn’t elaborate or discuss leadership changes at the department. Holder defended his 2009 remarks that America is a “nation of cowards” when it comes to race, saying the country is “still reluctant to talk about issues of race. 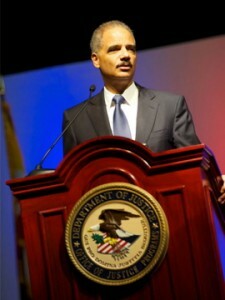 Holder said he hopes his legacy involves improving the country. “As a person who tried to make the country better and used the power of his office to raise issues that too often were not addressed,” Holder said. Posted: 10/30/14 at 9:15 AM under News Story.